Going way back to the year 2000 (in the time machine I don't actually own), DJ and music producer Armin Van Buuren had a few extra monikers under his sleeve, including Gaia, as another excuse to create perhaps a different style of trance than fans of his regular name would expect. But he only released one song under the guise of Gaia that year, "4 Elements", before it was delegated to the depths of nowhere for nine years. 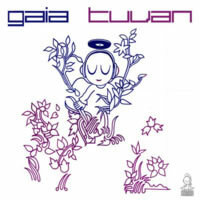 In 2009, along with his co-producer partner Benno De Goeij (half of Rank 1), Gaia was magically revived with some sort of funky trance potion, and out popped "Tuvan". Named after a Turkish people in southern Siberia (or the language they use), the revival of Gaia was successful enough for the project to keep going to this very day. First and foremost in the 3-track package is Gaia's Original Mix, which starts out in typical dance track fashion: with a steady beat and some variously fading choiresque pads. It isn't until the strange rhythmic female tribal moans check in that Tuvan starts to take shape and get its own character. In fact, those moans basically MAKE this track. Eventually, a techier synth sneaks its way in to add a hauntingly alluring melody and complete the ensemble. While pleasing on the first listen, it does tend to sag and lose its edge on subsequent replays, which is a shame. Not a bad tune overall, although it's the ever-so-slightly gimmicky voice clips that will be remembered above all else. In terms of remixes, the Gareth Emery Remix will also please fans who want a slightly rougher sound with its sharper bassline before leading to the main course, filled with extra trancy pads and a bonus melody not heard in the original. Gareth Emery has clearly put his personal touch on the mix, and it's enough to be worth a separate listen. He doesn't shy away from those vocal chops, though, but they're not the primary focus here. And for yet another awesome remix, look no further than the Andy Blueman Remix. It doesn't take long before an overwhelming blend of hypnotic, almost Middle Eastern sounds take over your senses. Andy Blueman has created an aesthetically-pleasing full-sounding experience as he makes his way to the chorus, littered with melancholy violins and utter despair before rising back up with a powerful synth-laden experience that will please your ears to the max! There's very little empty space in this one, and honestly, I love trance songs that sound and feel full. This one fails to disappoint and, frankly, could be its own song altogether. Definitely check this one out! Gaia's return to the scene has been quite successful, and Armin's choice of remixers, though small, is topnotch. Both offer something fresh while holding on to the spirit of the original, though the Andy Blueman remix gets the nod for delivering the non-stop power. If you're a fan of modern trance or of Armin Van Buuren, don't be afraid to check this package out!